In the next Special Issue our team travels to the South of Germany, in a town close to Freiburg im Breisgau, on the border of the Black Forest. 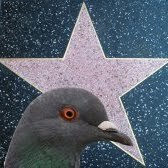 We are going to interview Mr. Jörg... it is said that he is a pigeon whisperer. We meet him in a forest close to his hometown. 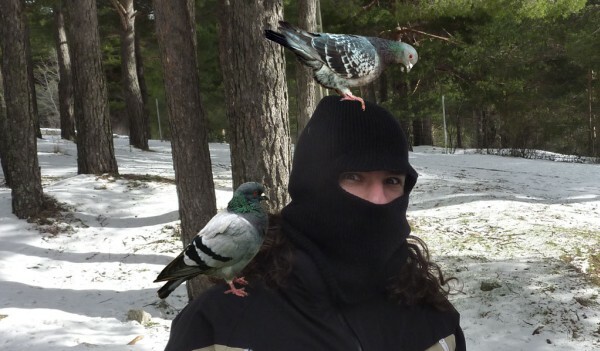 He comes dressed in a balaclava with two feathered friends. We felt a bit frightened so firstly I ask him: Why do you dress like that? Is it because of the cold?. No no, -he says- it is actually because of the pigeon droppings. I'm training Thomas Müller, who now is clumsily moving on my head. Mesut Özil (on my shoulder) is a well trained pigeon that is helping me during this exercise. Are you using German football players' names? I ask. Yes, yes. I like football and pigeons...so why not combine them? We are surprised how Mesut Özilis stares at Mr. Jörg... just waiting for his command. Jörg takes off the balaclava. He is smiling and looks a friendly person... later we will discover that he is not nice at all because he uses pigeons for unethical purposes. Jörg poses with Mesut Özil and Thomas Müller on his shoulder and head, respectively. I invite him to tell us his story. Yes, of course -Jörg says smiling even more broadly- I have liked pigeons since my childhood.... my father used to breed them. Then, a few years ago I enrolled in the German Army and served in Afghanistan. There, in our base, I met an Afghan man who breeds pigeons too. 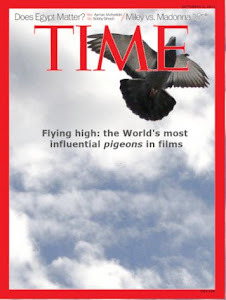 Pigeon breeding is a very old Afghan tradition but the Talibans banned it... if you like pigeons.... you could be killed as could all your birds.... terrible!! Anyway, we discovered this hobby in common and we became friends. He tought me about an ancient technique for training pigeons. Look at that!! he says as he opens the car's boot and a flock of pigeons flies out of it. Now they are heading back home -Jörg says- but look at this formation!!. 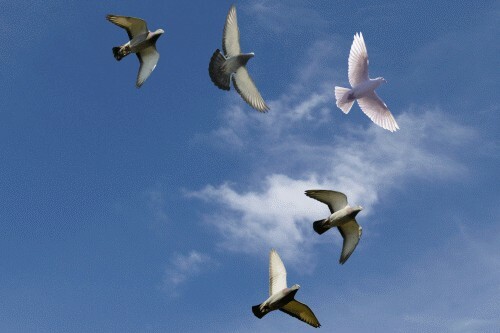 We saw the pigeons flying in a perfect V formation: four pigeons lead by a dove. It is awesome!! I said. ﻿Can they form more complicated figures like a heart? -I naively ask- He became very upset: What do you think? That this is the Cirque du Soleil? I spent two years creating this formation.... I don't like to keep the pigeons in the boot because it is very disturbing for them but I did that to impress you and now all you say is that it is not enough? These are the all stars of the SC Freiburg football team!!! I'm Sorry -I said- I didn't know that. He smiled again... don't worry.... let's go to my base. We took the car.... Jörg was driving with Özil and Müller wandering around on the back seat. When we arrive to his training camp I asked him about his motivation for doing this. Of course, -he says- I like pigeons but I train them for making profit. Unfortunately, my V formation service didn't have much success at weddings and birthday parties. Children usually like to see them flying and enjoy playing with the pigeons but their parents don't think the same.... all because of the bad reputation of pigeons.... if I had flamingos instead..... I would be rich now. I notice some sorrow in him. Ok. I'm going to show you how I make money. He proudly says while he starts the car engine. 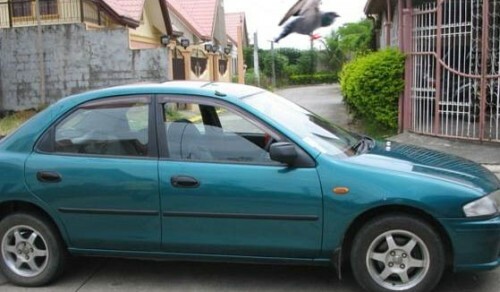 He parked his car on one side of a small road and suddenly a pigeon dives very fast swooping down towards the car.... in an instant, without breaking its flight, it poops on the car and flies away. Miroslav Klose striking the car. What was that? I exclaimed. That was Miroslav Klose striking the car. But he left a super poo on it! I said. That's the point!!! Jörg said very proudly. Look now how Klose is checking his mess.... I call it double-checking.... if he had failed he would retry later!!! The proof of Klose's strike.... we can observe him doing the double checking technique. Try to imagine that every single morning when you go to your work you receive this kind of present. And the most terrible thing is that it is impossible to prevent it. A real nightmare!!! Ahahaha!!!! Now our team was completely scared. This man is a greedy bully! He is corrupting the harmless nature of pigeons for making money with evil intentions. We abruptly decided to conclude the interview. His last words were... I will train a Cristiano Ronaldo for you!!! I so hope this is real. I'm dying.